Use the Hobbes POEfinder to determine if a network cable or port is providing Power-over-Ethernet. 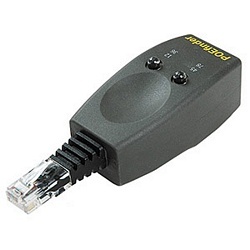 When you plug a network cable into the tester (or connect the tester to a network jack), an LED will light up if active 24-48V PoE is detected. The tester will also indicate if the PoE is active on the endspan (1-2/3-6) or midspan (4-5/7-8) pairs.